Bing will show the spellchecked search results from Google, without fixing the misspelling. 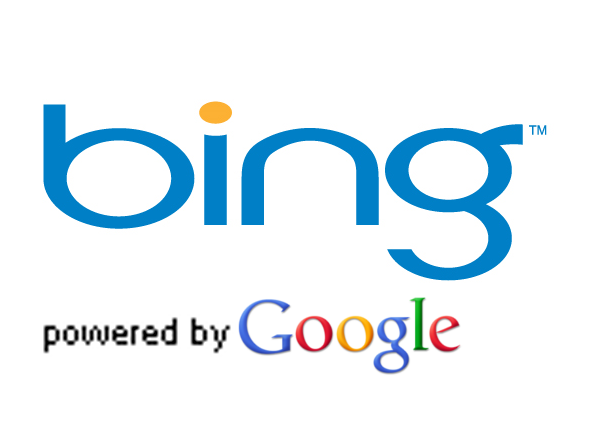 Bing results have been suspiciously close to Google results for a long time, Google decided to create a sting operation. Google created non-sense words and results pages for those made-up jumbles of characters. Google tasked engineers to search for these words from home, using Internet Explorer with Suggested Sites enabled and the Bing toolbar installed. Soon after, these non-sense search results (Which had NOTHING to do with the term searched for) started popping up on Bing. 7 out of 9 tests give overwhelming evidence that Bing has been stealing search results from Google. So what exactly does this mean for Bing? Microsoft is holding a search event later today (which is why Google could be unveiling this now), and Matt Cutts is on a panel with them later today, so I expect we will hear more then. Check out the very thorough and awesome analysis of the situation by Search Engine Land.